Hi everyone. 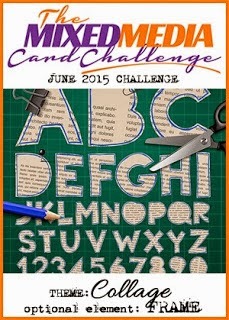 Today is the start of the June Mixed Media Card Challenge ... you're going to have fun with this one!! I hope you'll give this a try. By the way, I tried this technique on a few different papers. I used watercolour paper (works great) and with the above, I used mixed media paper ... love the results on that card too! I inked up my script background is soft gray, removed some of the ink in random places and stamped over top. I then stamped my flowers and bees in black archival. For some reason the flowers didn't turn out very dark, so I went over them with a permanent black marker. I then poured a few drops of my sprays onto a palette and painted the flowers. Wink of stella was added to the bees for a little bit of sparkle, and I added the frame as a finishing touch. I hope you'll join in our challenge of collage stamping at Mixed Media Card Challenge. The challenge is open for the whole month, so there's lots of time to play along. Hope to see you there! Fabulous creation Loll, love the background. I like the background you created! Happy thoughts coming your way too, dear Loll. It's been fun learning from you with all your wonderful techniques. Will miss your beautiful cards on the team, but know where to find you. Happy creating. Stunning Loll!!!! I love your cards, there so creative!!! What a gorgeous background, Loll! This is a technique on my to do list! Want to get to it even more now! Love this! Your stencil monoprint turned out so well - especially impressive, given it was only your second attempt! An all around fabulous card! Beautiful, Loll - I love that mono print background - so soft, yet gives the card such depth! Congrats on your well deserved win over at AAA cards! You did a beautiful job on the background, Loll, and I love those little bees buzzing around your colorful flowers. Love your Stencil Monoprint BG for your wonderful mixed media card Loll. Isn't that technique just SO much Fun? TFS mf. What a gorgeous card you created! Love the colors in your background and those adorable bees! Thanks for the plug, Loll :) You are a sweetheart! And this turned out amazing, as always! What a gorgeous final design for the MMCC! Love the little bees buzzing around the flowers...the perfect touch! I really love this card, Loll! Your background is so pretty and really makes these charming flowers pop ~ Love the color combo and all the wonderful sparkle on this card, too!